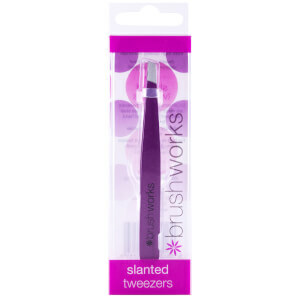 Tackle stray hairs with the brushworks Traditional Tweezers. Made from durable stainless steel for high quality performance, the slanted tweezers have been designed with a curved shape to ensure a firm and comfortable grip during use. A must-have multi-tasking beauty tool, the tweezers are perfect for eyebrow grooming and applying false eyelashes. Easy to use and travel-friendly. Use to pluck out stray eyebrow hairs or for precise placement of false eyelashes.